Pazzo! Cucina Italiana located at 853 5th Avenue South officially reopened on Friday, November 9, following the completion of its much-anticipated interior renovation. The restaurant features a completely updated interior and entirely new menu. The renovation intends to create a more casual and intimate environment. Pazzo! was one of the first restaurants to open on 5th Avenue 23 years ago. Today, Pazzo! serves as the Avenue’s longest running Italian restaurant and is proud to be under the same continual ownership since 1996. Pazzo! is adored by Naples residents and the owners are thrilled to be giving the classic restaurant some love and updates. Key interior renovations include updates to the floors and ceilings, new seating, and a stunning chandelier. 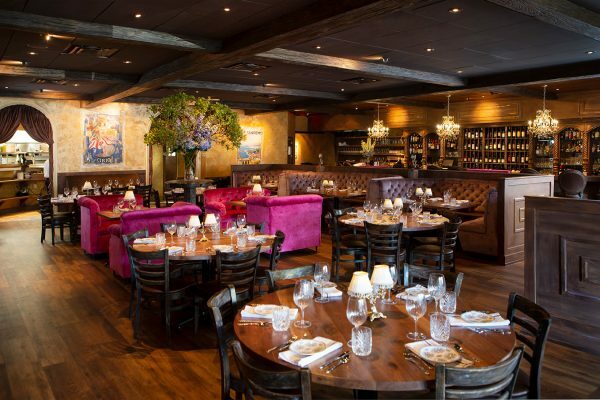 The pure wood floors intend to create an intimate and casual atmosphere in the restaurant. The ceiling, made of show-stopping custom tiles, is supported by dramatic Tuscan beams finished in rich dark brown hues. Unique blown glass purple and gold chandeliers featuring grapes and figurines accent the drama of the ceiling. Updates to the tables, chairs, and barstools are among the most significant changes to the restaurant. Pazzo! had custom chairs and booths made to achieve their exact vision for the interior. Brightly colored sofa chairs and velvet booths cultivate an inviting and comfortable space to enjoy good company and great food. Velvet booths and hot pink chairs add a whimsical and sophisticated vibe to the space, like a restaurant found in Europe or New York City. The new décor elevates the restaurant to a more modern and elegant space while maintaining the casual comfort the restaurant is known for. “Pazzo! has always been a unique restaurant food wise but we never felt like the décor quite matched the quality of the food. With these renovations we will be able to provide a more sensational experience for our guests,” said Skip Quillen, Owner of Culinary Concepts. Culinary Concepts owns three restaurants on 5thAvenue – Pazzo! Cucina Italiana, Chops City Grill, and Yabba Island Grill. Pazzo! also overhauled their menu adding new exquisite delicacies while keeping the integrity of the classic Italian menu items that have earned Pazzo! their reputation for the past 23 years. Pazzo! added new dishes with impressive combinations to show off their skill and evolution while keeping classic favorites like their famous butternut squash ravioli and chicken parmesan. All pasta items on the menu are made fresh daily in house by the same chef that was hired 23 years ago. Old school Italian techniques are infused with modern flavors creating an outstanding menu. “We are thrilled to have this Naples favorite open again just in time for season. Pazzo! has always been a staple on the Avenue and their investment in this renovation represents the thriving 5th Avenue South location,” says Bruce Barone, Jr., Executive Director of the 5th Avenue South Business Improvement District. Pazzo! is officially open and eager to show off the renovation. Construction was completed by Naples-based Lotus Construction and designed by architect Brooks Swanson. 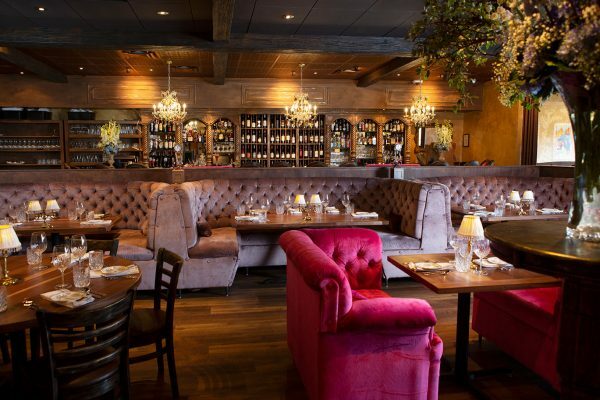 Theresa Gillan of City Furniture designed the restaurant’s new interior. New staff members have been in training prepping for the upcoming season. Since its grand opening on Friday November 9th, Pazzo! has received rave reviews and feedback from regulars and new customers alike.